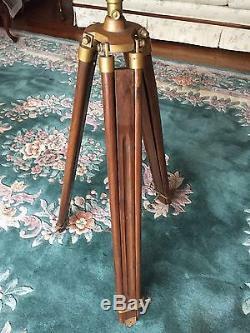 Vintage Brass Library Telescope with Brass and Wood Tripod Base Maker? Would make a great gift for a special occasion, or keep it for yourself. 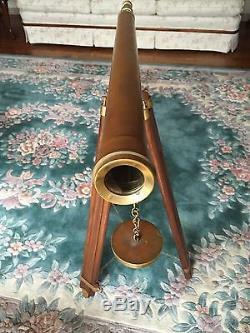 This is an vintage library telescope. There is no makers mark on it that we can ascertain. The telescope probably dates to the 1960s. 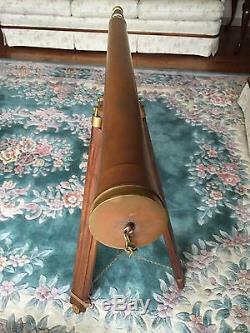 There are some minor dings along the body of the telescope. The wood legs are intact and the brass screws for adjusting the leg height are in place as well. The chain that holds the legs together is also in place. The viewing end lens and the large lens are both in place. The end cap on the large lens is in place on a chain to hold it when taken off. The lenses show dirtiness, but no cracks or blistering. The adjusting screw for the viewing lens is operational. There are 3 lenses that we can see. Two at the end your eye goes and then the large lens at the other end. There is no slide or cap for the small lens you put your eye to to protect it. 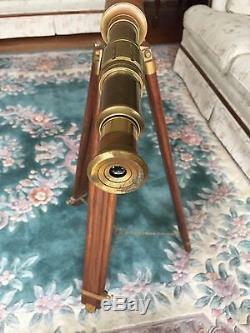 The telescope is 37-3/8" tall, by 38-7/8" across (with lens in full contracted position), by 2.5" wide at the cap of the large lens by 1-7/16" at the small lens. 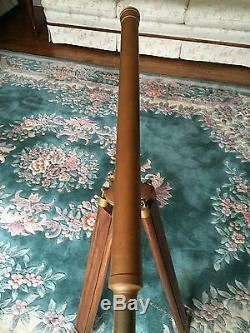 The body of the telescope will be detached from the base and legs. So, expect to have to do some re-assembly. 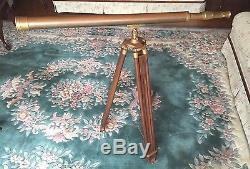 Other items that can be seen in the pictures are not included, only the telescope described here. Let us know if you have any questions or need additional pictures. Dont be shy to make an offer, we are always open to reasonable suggestions. The pictures provided both complement and supplement the listing description, so please look at them very closely as well. With old items, there is no way one can capture all the little imperfections in words, so the two media are meant to be the full description. Make sure that this item meets your needs and requirements before deciding to acquire it. So, please carefully review all the attached pictures. Ask all the questions you have, come see in person or send a friend to see the item on your behalf, prior to deciding to acquire it. Please check out our other Timeless Tokens store listings as we are regularly adding new items. We specialize in vintage artwork, books, collectibles, furniture, musical instruments, paper ephemera, marine/nautical, and clocks/watches. Select countries (disclosed in individual item description). All items are as described, with any item history, known defects or imperfections disclosed in each listing. Welcome to Timeless Tokens, our online store, offering antiques, collectibles, and conventional merchandise for every need and occasion. Timeless Token represents the fulfillment of a long-held dream to create a business that allows us pursue our passion for finding unique collectibles and everyday items that can be shared with and appreciated by all. Our listings are updated regularly and focus on items that we know best - vintage artwork, books, clocks, collectibles, furniture, toys/model trains, musical instruments, and decorative boxes. We appreciate your taking the time to visit our store, and hope you will provide us feedback that will enable us to make your shopping experience the best it can be. Referrals are an important part of our business. 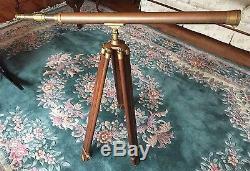 The item "Vintage Brass Library Telescope with Brass and Wood Tripod Base Maker" is in sale since Monday, June 26, 2017. 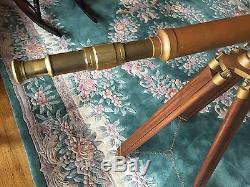 This item is in the category "Antiques\Maritime\Telescopes". The seller is "hallboys321" and is located in Wilmington, Delaware. This item can be shipped to United States, Canada, United Kingdom, Denmark, Romania, Slovakia, Bulgaria, Czech republic, Finland, Hungary, Latvia, Lithuania, Malta, Estonia, Australia, Greece, Portugal, Cyprus, Slovenia, Japan, Sweden, South Korea, Indonesia, Taiwan, South africa, Belgium, France, Hong Kong, Ireland, Netherlands, Poland, Spain, Italy, Germany, Austria, Russian federation, Israel, Mexico, New Zealand, Philippines, Singapore, Switzerland, Norway, Saudi arabia, Ukraine, United arab emirates, Qatar, Kuwait, Bahrain, Croatia, Malaysia, Chile, Colombia, Costa rica, Panama, Trinidad and tobago, Guatemala, Honduras, Jamaica.